Fun, interactive toss and tug toy. Durable reinforced nylon fabric covers two balls-a tennis ball on top and a squeaker ball beneath. Long tails make it easy to pick up and throw. 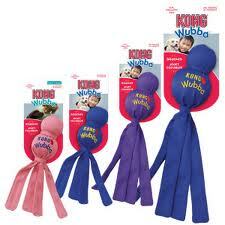 Dogs love to squeak the Wubba and shake the flapping tails back and forth. Available in three colors: Red, Blue, Purple. Available in three sizes: Small, Large, X-Large.